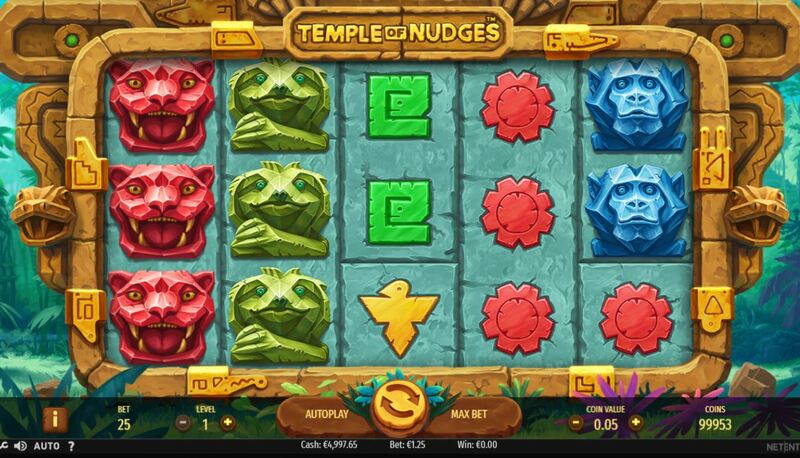 Temple of Nudges slot by Netent where wins nudge down and repeat! 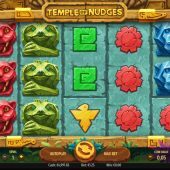 Temple of Nudges slot is a pretty basic and very simple game from Netent although as of yet I'm not sure what they've tried to achieve here. The blue stone reels lie within what looks like a Central or South American temple with the game being very quiet barring a very quick piece of native pipe music and some soft rumbles as the reels stop. There are hints of Jungle Spirit along with Gonzo's Quest here although I can tell already that most players will not choose this game ahead of those two. Will this Temple of Nudges prove to be the temple of doom for our bankroll though? We have 243 ways to win on Temple of Nudges slot over 5 reels of 3 rows each. Symbols are stacked and there are no Wilds or scatters either! We pay 25 coins to play and it gets worse - the 5-of-a-kind pays are as follows...Red Jaguar 9 coins, Yellow Pig or Green Sloth or Blue Monkey 6 coins. There are four low-value icons too, or should I say ultra-low. These are Sun, Quetzal, Snake and Pyramid all paying a titanic 3 coins for a full way of 5. So as the name suggests, Temple of Nudges slot has to be, well, all about the nudges! The icons on the reels are 5-rows high at their best. Any win of 3OAK or better will pay the ways in play and then all reels with winning tiles on will nudge down 1 row, and if wins are still lined up they will get added to the total. With symbols 5 or more rows high this means you can get the same win, or a win, for 3 or more consecutive free respins. If you are lucky you may also see a respin tile on a non-winning reel, say reel 4 or 5. So the win already present will nudge and the non-winning reels will respin, hopefully adding more winning symbols and turning a 3OAK to a 4OAK win for example. If we take the top symbol which lines up on all 5 reels perfectly and nudges twice, we'd see about 250x bet. The top pay seems to be around the 350-400x bet mark.